• The only fair tax is Poll Tax, income tax or sales tax/VAT (skip to article). • We have to have VAT because the EU says so (skip to article). 1. MYTH: "I pay for local services out of my Council Tax." We can dismiss this one straight away, because whatever the logic of it (and it has no relevance to the merits or demerits of LVT), it is simply a downright lie. We know for a fact that Council Tax currently raises £32 billion a year (before deducting Council Tax benefit), which is only about five per cent of all tax receipts. To be able to make such a statement, you would then have to say what you mean by "local services". The last time I looked, apart from defence, paying debt interest and maintaining embassies and consulates abroad (and ignoring corporatist subsidies, theft and waste), everything the government does is "local". It spends about £150 billion a year on the NHS and the state school system alone. There's plenty of other stuff on top of that which is clearly "local" (road maintenance, police, law and order, refuse collection, street lighting, social workers etc) which brings the bill to £200 million. Suffice to say, Council Tax covers barely one-seventh of the cost of such "local services". And you could just as well argue that welfare and pensions spending are local services, because they are paid to people who all live somewhere, and wherever they live is "local", and every bit of land benefits from the fact that we have these non-local services (defence, paying debt interest), in which case Council Tax only covers a twentieth of the cost of "local services". 2. MYTH "The UK already collects more tax from property than any other OECD country"
The OECD takes a very wide view of what constitutes a tax on immoveable property. It is true that the UK's Business Rates is very high by international standards, as is Stamp Duty Land Tax, but Council Tax is quite low. If you add these together, the UK is at the top of the table (it wouldn't be if Hong Kong and Singapore were included), but out of the £80 billion-odd in such taxes collected in the UK, how much is actually an annual tax on the rental value of land? 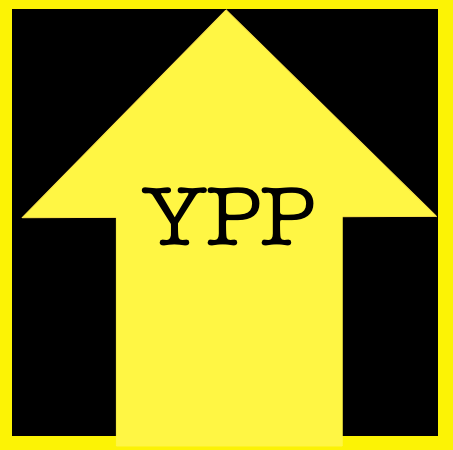 - Business Rates (£30 billion), is quite similar to LVT (and high by international standards). - Stamp Duty Land Tax (£14 billion) is a tax on certain transactions in land and buildings, it relates to land values and is highly progressive but is not proper LVT (it is a very crude LVT payable in advance). - Inheritance Tax and Capital Gains Tax (£14 billion) are general taxes which apply to lots of other things than land. A fair chunk of estates and capital gains affected relate to land values, but these are not LVT (they are a very crude LVT payable in arrears). - Council Tax (£32 billion before rebates) is closer to a Poll Tax than LVT (although administratively could easily be made much more like LVT). It varies depending on what a home was (or would have been, had it existed) worth in 1991. In 1991, house prices were much flatter around the UK and values were closer to the "bricks and mortar" value, so you could say that it's a tax of about £300 for each room in a home, if you have more than nine rooms, the rest are tax-free. - The OECD ignores subsidies to land ownership, such as the £10 billion paid to private landlords as Housing Benefit or the £4 billion paid to owners of farmland (a kind of negative LVT). So actual quasi-LVT (Business Rates) is less than 5% of UK taxes collected, not the 12.5% given by the OECD (tables). The amount of quasi-LVT (ad valorem annual property taxes) collected in the USA and Canada is much higher in the UK; the bulk of their property taxes are annual taxes pro rata to the value of each home, with no upper limit in most states (some apartments on Manhattan cost over $100,000 a year); and their Stamp Duty Land Tax equivalents are much lower. 3. "The only fair tax is a Poll Tax, income tax or sales tax/VAT"
The distinction between 'local' and 'national' services is highly artificial, to all intents and purposes, the UK has one single national tax-raising system; even supposed 'local' taxes like Council Tax or Business Rates are dictated by UK-wide rules (these are diverging slightly for Scotland). Simply putting the word 'local' in front of a tax or earmarking it for 'local' spending adds nothing to the merits or demerits of the tax. When arguing against LVT, people's stated preferences is usually based on whatever system they think will mean that they pay less than now (and everybody else will pay more. People with high incomes like the idea of a Poll Tax; people with low incomes like the idea of income tax; and people with a modest lifestyle like the idea of Sales Tax (such as Value Added Tax). The arguments for a Poll Tax are the opposite of the arguments for income tax, Land Value Tax sits comfortably between the two. The actual economic or practical advantages or disadvantages of all these taxes can be summarised as follow. A Sales Tax is even worse than Income Tax, and starts to take on some of the disadvantages of a Poll Tax (but without the advantages). 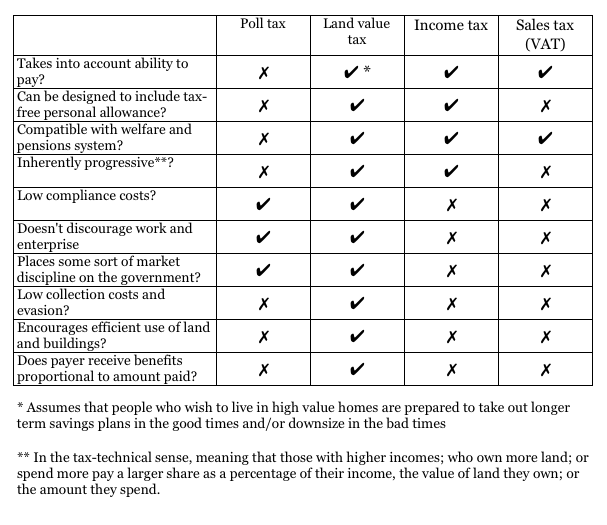 Land Value Tax comes out the best when judged by objective criteria, with income tax in second place. 4. "Will LVT be a national tax or a local tax?" The answer is "both". Ideally, it will be set at a national rate (as is Business Rates at present) and collected locally. To keep per capita spending the same, areas with high land values will receive less from central government out of general taxation and areas with low land values will receive more. The whole topic of local government finance is currently nigh impenetrable. It is a mixture of a small amount of locally collected national taxes (Council Tax and from since 2013, a proportion of Business Rates) and hundreds of different adjustments to and fro to say how much money each council, local NHS, local education authority etc gets from central government out of national taxes. And of course there are different layers of local government: town and parish councils, local boroughs, county councils, unitary authorities and regions such as Scotland, Wales and Northern Ireland. Officially, only about one-quarter of total government spending is "local", but you could easily classify two-thirds of UK government expenditure as "local", i.e. anything that can reasonably said to be spent in a particular area. So in the wider sense, this includes an NHS hospital, a state school or university, roads, the local police, refuse collection, Housing Associations and of course pension and welfare payments to people in an area. Truly "national" stuff is only defence, immigration control, foreign embassies and consulates, debt interest and so on. If some councils decide, for political or ideological reasons, to collect less than what they are entitled to collect and cut back on "local" spending accordingly, well, that is their decision; their grants from central government would not be increased to make up the shortfall. Clearly, central government grants would have to be re-assessed regularly and tapered gently so that local councils are incentivised to improve their areas as best they can, because they can keep any increase in rates receipts in the medium term. No system is ever going to be perfect but you could hardly make it worse than it already is. 5. "We have to have VAT because the EU says so"
This was quite true, but now that the UK government appears to have accepted the narrow majority for "Leave" in the 2016 Referendum, we are free to reduce the headline rate and preferably scrap VAT altogether. What's wrong with corporation tax? Isn't this a tax on profits, which means it wont have the negative effects of VAT in terms of hitting marginal firms the hardest? Anon, for sure, corp tax is the second least bad tax on business, being a flat 20% or so, but it only raises £40 billion a year (compared to the worst taxes VAT and NIC which are £100 billion each) but I consider flat income tax and flat corporation tax to be much the same thing (like in Hong Kong). Thanks for your reply. Presumably if corporation tax were raised, say to 40 or 50%, it wouldn't end up raising much more revenue, due to Laffer effect? Someone the other day suggested to me that it (or 'profits taxation' generally) would be just as good as, if not better than, LVT in terms of its lack of distortion affects on production. But above a certain level it would presumably be a massive disincentive for businesses to make profits at all, so wouldn't ever raise much more than it already does? Anon, make up your own mind about what the revenue-maximising tax rate is for Laffer purposes, maybe it is 50% and that would raise twice as much as now, that is not the point. The point is that a tax rate of 50% reduces the size of the economy by between 10% and 15%. That is an absolute loss to everybody and of benefit to nobody. LVT simply has no deadweight costs, there is no disincentive to making profits and every incentive for using as land as efficiently as possible, it all reaches its own equilibrium. So whoever said that to you was talking complete and utter rubbish. Could we not just leave the EU so we can get rid of VAT? No need to leave the EU. We just need to man up and refuse to comply with the more stupid things (like VAT) and either they accept it and we stay in (good) or they chuck as out (also good).